Then, raise car and support securely on jack stands. Failure to do so can result in injury or death. DO NOT place any part of your body under the car when only supported by a jack. Unbolt 14mm nuts on bottom portion of existing motor mounts that protrude through the frame (mount-to-frame). Raise the engine slowly, ensuring that you lift from the transmission, until the engine separates from the mounts and you are able to remove existing mounts and base cups. Remove hardware from Banzai Racing motor mount. Note that bolt is threaded through the top end washer. 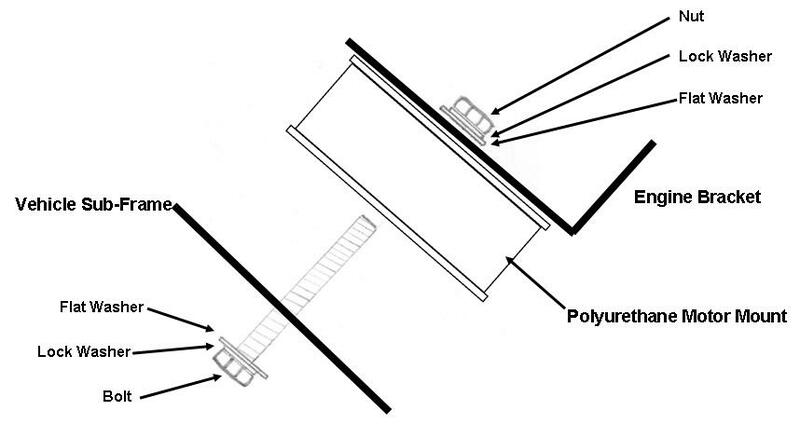 Place new motor mount on top of sub-frame in location of old mount, as shown in illustration below. Insert bolt through sub-frame and thread into motor mount, ensuring that a lock washer and a flat washer are between bolt-head and sub-frame. Lower engine slowly until engine bracket rests on new motor mounts. Place flat washer, lock washer and thread nut onto end of bolt and tighten with wrench. These mounts cause slightly more vibration than stock mounts but significantly less than solid ones. Stiffness can be adjusted by increasing or decreasing the amount of compression on the polyurethane. This is achieved by loosening the top nut and tightening the bolt to increase stiffness (or loosening to reduce stiffness). Then re-tighten the nut. If you have any questions or concerns regarding installation of these motor mounts please contact us.